When two catastrophic natural disasters struck within days of each other in May 2008, disaster relief, humanitarian aid, and health officials, as well as members of the news media tapped into a unique set of NASA data products describing the location of the exposed populations. In the hours and days following the cyclone in Burma and the earthquake in China's Sichuan Province, workers had the data they needed to assess the numbers of people possibly affected in these deadly events. What arose was a timely example of how NASA data comes to the aid of officials when such disasters occur. "The gridded population product we produce helps officials understand the density of the population in and around a disaster area," said Robert Chen, manager of NASA's Socioeconomic Data and Applications Center (SEDAC) and director of the Center for International Earth Science Information Network (CIESIN), part of the Earth Institute at Columbia University in New York. "The data set shows where people actually live in relationship to hazardous events." Members of the news media use the data and associated maps to report on possible casualties and property destruction. "When a major disaster hits, people want to know how many people were exposed to the disaster, in addition to how many were killed," said Chen. "For example, CNN used our map of population density in Burma to help explain how the unusual path of cyclone Nargis affected the low-lying, densely populated delta." Using the SEDAC data, media were able to report that 25 percent of Burma's 57 million people resided in coastal areas overpowered by the cyclone. They also projected that a million people would likely face homelessness, a number calculated by the United Nations (UN) also by using data made available by SEDAC. SEDAC, a part of NASA's Earth Observing System Data and Information System, collects, stores, processes and distributes population, land use, and socioeconomic data. A significant mission of NASA's Earth-observing satellite program is to enable scientists and other users to conduct analyses and make decisions based on the resulting data. SEDAC advances this mission by developing and operating practical applications that merge social science and Earth science data to improve knowledge of how humans interact with Earth's environment. SEDAC and CIESIN's joint staff of more than 60 is made up of a diverse array of demographers, geographers, earth scientists, public health specialists, and information technologists. 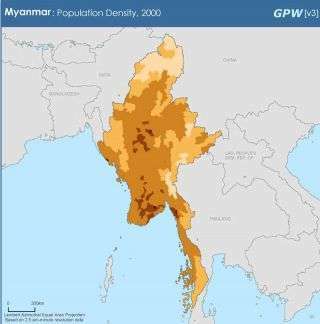 For the gridded population data, they collect two different types of input data: state and local population data for every country of the world and Geographic Information System (GIS) data on the boundaries of states, provinces, counties, and other administrative units within these countries. Next they integrate the population figures with the GIS data to produce density estimates for a given area. By converting these data to a regular latitude-longitude grid, they enable the data to be used with a range of remote sensing information such as land cover data from the Moderate Resolution Imaging Spectroradiometer instrument aboard NASA's Terra and Aqua satellites, data from the NASA-built Landsat satellite for vegetation data, and high-resolution satellite images from the ASTER instrument on the Terra satellite. Marc Levy, SEDAC's lead project scientist and CIESIN's deputy director, pointed out that a particular concern in the case of Sichuan is the location of built-up urban areas. "For that, SEDAC's Global Rural-Urban Mapping Project (GRUMP) has combined satellite data on night-time lights with population and other administrative data to estimate urban characteristics," said Levy. The GRUMP data available from SEDAC include urban versus rural population densities and the extent of "built-up" urban areas. Columbia University researchers worked with the World Bank and other partners in recent years to develop integrated maps of global disaster risk "hotspots." Many parts of the world, including the heavily populated Asia-Pacific region, are even susceptible to overlapping hazards like cyclones, earthquakes, landslides and tsunamis. The team linked six natural hazards - earthquakes, volcanoes, landslides, cyclones/hurricanes, floods, and drought – with population exposure and historic mortality and economic impacts data to identify areas of relatively high risk of disaster. In fact, CIESIN researchers have recently used population maps in the wake of significant child casualties in the Sichuan quake to estimate the number of children around the world who live in areas of relatively high earthquake risk. "Although our information is most useful for groups needing to know how many people were in the exposure zone where a disaster occurred, it also helps when looking downstream at secondary impacts like disease, homelessness, hunger, and even conflict," said Levy. "We have begun working with groups like the UN's World Food Programme and nongovernmental aid groups to develop new data and tools to assist with planning for disaster recovery and reconstruction." SEDAC and CIESIN work with both U.S. and international agencies such as the U.S. State Department, the UN Geographic Information Support Team, and the World Health Organization to ensure that SEDAC's data are both accessible and usable. "Sometimes users just need a simple map, but at other times they need detailed data for analysis," said Chen. "We are working to provide both, in part by making our data available through tools such as Google Earth and NASA's World Wind that enable users to visualize data quickly and easily." In the future, Chen says that the Center will try to gain more insight into a variety of issues: what types of structures people live in, how accessible they are through roads, how age, gender, and health affect vulnerability, and how other factors such as poverty, conflict, infectious disease, and water scarcity interact with natural hazards. "We need to improve our understanding of the human side of the equation using the data capabilities we have and will have in the future," said Chen. "This is very critical to the welfare of populations everywhere."